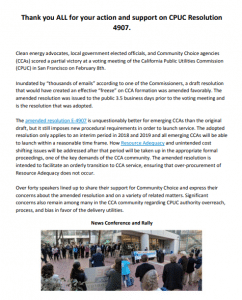 Although Community Choice agencies are only “lightly” regulated by the California Public Utilities Commission, there are substantial regulatory issues that frequently require attention from those defending and advocating for Community Choice. A comprehensive repository of regulatory matters related to Community Choice is maintained at the CPUC’s Community Choice Aggregation page. If you are searching for a specific document, the CPUC maintains a document search page that might help. PG&E Safety Culture Investigation I. 15-08-019 (In this case, Center for Climate Protection is a Party to the Proceeding). Read our Opening Comments HERE. PG&E Bankruptcy. In addition to the above proceedings, we are also keeping a close eye on the PG&E Bankruptcy, which is playing out in four arenas: the bankruptcy court, the CPUC, the CA State legislature, and the Federal Energy Regulatory Commission (FERC). Customer Choice Project. There is an informal activity in progress that relates directly to CCAs, the California Customer Choice Project (formerly known as the “Green Book”). AB 2514 Energy Storage Mandate. Lastly, all LSEs in California, including CCAs, are required to procure certain levels of storage under the Energy Storage Mandate in AB 2514. The CPUC oversees the implementation. On October 11, 2018 the Commission voted to accept the second revised version of Commissioner Peterman’s Alternate Proposed Decision. The decision (APD) rejected the Green Allocation Mechanism (GAM) and the Portfolio Monetization Mechanism (PAM) proposed by the Investor Owned Utilities (IOUs), caps the annual PCIA increase at 0.5 cents/kWh beginning 2020, finds that all utility owned generation is recoverable, rejects the 10-year rule, establishes a true-up for PCIA costs, and initiated Phase 2 of the proceeding. Phase 2 will utilize 4 co-chaired working groups. October 11 – Decision 18-10-019 modifying the PCIA. Commission press release predicting CCA rate increase. October 26 – Joint Petition for Modification of Track 1 Decision D.18-07-009. November 19 – Applications for re-hearing of Decision 18-10-019 by POC, CLECA and DACC, CalCCA, Shell, and PCE/MCE/SCP. The amended Resolution E-4907 imposes new procedural requirements in order to launch service. The main requirement is a mandatory delay in formation of a Community Choice agency. In order to launch a CCA in a given year, a prospective CCA must have submitted its Implementation Plan by December 31 of the year prior to the imeediate past year. So, for example, if a CCA wants to launch in 2026, it must have filed its IP by 12/31/24.